Say hello to the Wolf Guard, and its three mission campaign Fangs of Fenris. Full Control's latest expansion for its turn-based Space Hulk game is Fangs of Fenris, featuring the elite Wolf Guard, first written waaaaay back in White Dwarf #200 and now available in digital form. Sharpen your Frost Blade and get your Wolf Claws ready for this new three mission campaign. If you're feeling keen but don't have the game yet, you may want to wait until October 12th, since Full Control's celebrating the expansion with a 24 hour Steam sale. Space Hulk will be discounted by 33% for one day only; it's currently $29.99 on the Steam store. "When it came to selecting the first expansion chapter for Space Hulk we felt that the introduction the Space Wolves would be both a great addition to the game," says Thomas Hentschel Lund of Full Control, "and a nod to the fact that our studio is based in the heart of Scandinavia, the Viking kingdoms of the past." Space Hulk, for those not familiar with the franchise, is one of Games Workshop's finest, a strategy title in which you, as the Emperor's Space Marines, invade the interstellar ball of junk that is the Hulk. This is your chance to avenge past defeats, and reclaim your ancestors' honor, but beware: Genestealers lurk within, eager to tear your soldiers limb from limb. If you're not a Steam fan - really? 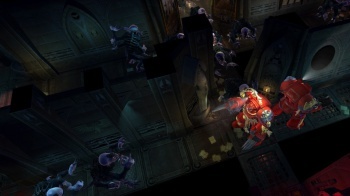 - Space Hulk is also available on Mac, and iOS devices.